This slow cooker pot roast recipe is full of Cajun spice and flavor. Making a mirepoix and searing the meat before cooking makes all the difference. Sure, Cajun food is associated with Louisiana – but Texas does not discriminate based on location. We just enjoy it all. Now, we all know there is just not anything more comforting than a fallin’ apart pot roast that has been in the slow cooker all day. Comfort food is great but it can get a little boring if it isn’t kicked up now and then. Well, I kicked it up with some Cajun flavor and you are going to love it. One of my very best friends is from Louisiana and I can tell you she is one of the few people that I let come in my kitchen and cook for me. Her food is amazing and when she makes stuff over here she adds plenty of love, nurturing, and a splash of Cajun style. If that wasn’t enough, a few years ago I found out that one of my cousins, who I hadn’t seen in literally decades, lived just about eight hours away in central Louisiana. Well, we headed over there to have a mini-family reunion and got to experience some of the most interesting foods and experiences of our lives. We had a blast. Just sayin’ – I know a little bit about that fiery Cajun culture between these two! Mirepoix is one of the secrets of the deep flavor of this roast – as is a really good sear on the meat before it goes in the slow cooker. Here’s what you do. Put a little olive oil in the biggest saute pan you have and let it heat up until it shimmers. You want it hot. You can’t crowd the vegetables or they wills steam and not saute so you may need to do this in two parts. Once the oil is hot enough add the vegetables and let them sit in the oil until they caramelize a little around the edges on the bottom. Once that happens flip the vegetables over and do the same thing on the other side. If they aren’t caramelizing you have too many in the pan and they are steaming not sauteing. When the vegetables are done, spoon them out of the pan and add a little more oil if needed. Let the oil get really hot and put the seasoned meat in the pan. [pullquote] Menu – Cajun pot roast, rice, salad, sour dough baguette, banana pudding [/pullquote]Let it caramelize on all sides and then take it out. Pour the red wine into the pan and stir it around scraping the blackened bits off the bottom of the pan. Add the beef broth and let reduce by about 1/4. Then just pile everything in the slow cooker, set it on low for eight hours, and walk away. This pot roast recipe is just that easy! When you dish this up, hot and steaming on the plate, mouths will water. It is amazing. Spicy, rich, meaty, and everything a pot roast should be – and then some. I use this 6-1/2-Quart Programmable Touchscreen Slow Cooker and I love it. It’s the one I got for my TV appearance. Take a look but know that it’s an affiliate link – if you buy the blog gets a little commission that helps support it. Thanks! Yum. Use a premixed Cajun Spice or mix your own. I used smoked paprika, ancho pepper powder, kosher salt, cayenne, pepper, garlic powder, and thyme. Rub it all into the meat before you sear it. Tender, spicy pot roast makes a comforting family dinner. Rub the seasoning into the meat on all surfaces and set aside. Heat about 2 tablespoons of the oil in your pan until shimmering. Add the vegetables and garlic but do not crowd - do it in two batches if necessary. When the vegetables blacken slightly around the edges turn them and caramelize on the other side. Remove the vegetables from the pan and add a little more oil. Remove the meat from the pan and deglaze it with red wine, scraping the bottom and sides until all of the bits that are stuck on are loosened. Add the beef broth and reduce by 1/4. Add the vegetables to the slow cooker, place the meat on top, and pour the wine mixture over all. Slow cook for eight to ten hours on low. Could this be made ahead and frozen with out compromising the flavors? yes – it should be fine. Mmmmmmmm this slow cooker pot roast looks amazing! Thanks … it totally was! This recipe sounds scrumptious and I’m so excited to surprise my family with something new. How much wine should i add to the recipe? 🙂 1/4 cup at most. What kind of Red Wine would be best for this ? Yum for falling apart pot roast! This looks absolutely delicious–exactly how I want my pot roast to be! I love your comment that Texans don’t discriminate. 🙂 I was raised in Texas, but my mother’s family all hails from Louisiana so cajun dinners make a frequent appearance around here. This recipe is definitely one we’ll have to try! Pot roast is one of my favorite meals, I love how you did something a little different by using the Cajun seasoning. At it’s always a bonus to be able to make it in the slow cooker! I was telling my husband yesterday that I want to make a pot roast – I can’t believe it’s mid-January and I still haven’t made one yet this season! I love the flavors going on here – yum! I try to make them several times during the year – they are perfect for Sunday after church! This recipe is calling my name. 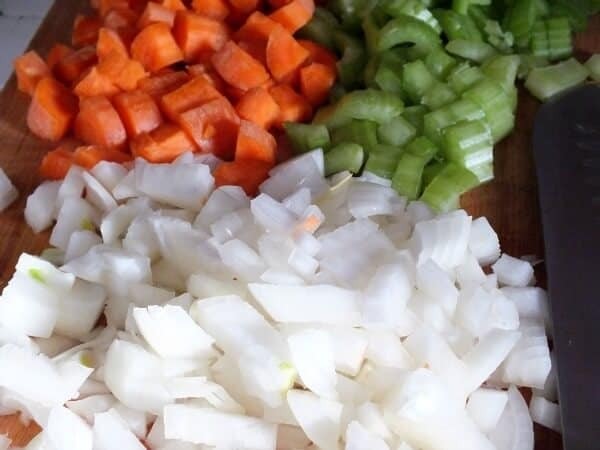 I love to use a mirepoix in recipes. The flavor from just those three ingredients is incredible. Sounds delish! The “trinity” over a pot roast with a kick of flavor? Yes please! So much better than boring old pot roast. Have one in the slow cooker right now! Mmm, I love pot roast. This looks delicious! You can’t go wrong with cajun flavors! This recipe is right down my alley. I just love Cajun spices. Another great crock pot recipe I’ll be adding to my list. Thanks! There are so many people I’d let come in my kitchen and cook. Even more folks are welcome to clean up! I’m easy, I know. Cajun food is something I’ve enjoyed a few times in restaurants but not really tried at home. Love the flavors, don’t really know why I don’t make it myself. Perhaps the absence to beets in most Cajun dishes! This pot roast looks awesome–and I could see some amazing sandwiches from the leftovers! It does make amazing sammiches! What a perfect recipe for this snowy and icy week! What a gorgeous roast…Looks wonderful. Great flavors.